Join us for an Easter Celebration on Saturday, April 20th! We will have LIVE MUSIC by Ben Benkert on the lawn! Bring a blanket or a lawn chair or reserve one of our picnic tables for premier seating and enjoy the afternoon! Soleil Wood Fired PIzza will be available for purchase. Sip & Scoop will be here for purchase! The Rockabilly Balloon Bender will be here with face painting and balloon animals! 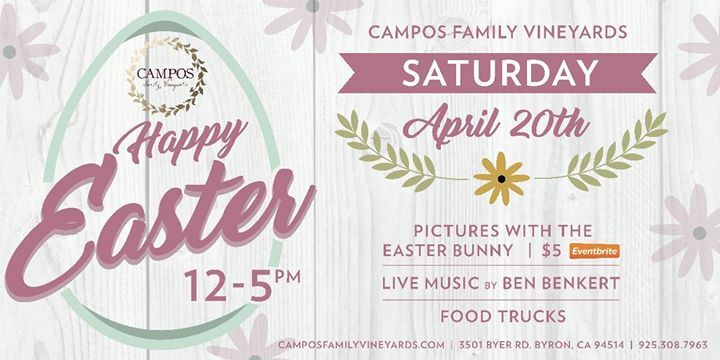 Photos with the Easter Bunny will be available! Please reserve your time slot! If you plan to enjoy the day with us, please reserve your spot! Tickets are limited. Those planning on Easter Bunny Photos will ALSO need a General Admission ticket to attend. No Outside Alcohol Will Be Permitted On The Property. All Bags & Coolers Will be Searched. There will be NO EASTER EGG HUNT this year!